Don't forget our Christmas in July event, the Sizzlin' Santa Sale, is next week! All Christmas fabric, including new fabric is 15% OFF. Plus some other sales that will be posted around the store during the hop! 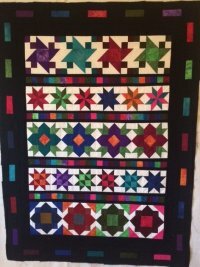 Visit each of the four shops, Colby Sew & Vac and Quilt Cabin in Colby, Smoky River Quilt Shoppe in Oakley, & us, Prairie Flower Quilts during the event to get your Jewel Tone kit to make a row by row project. The middle (5th row) is unique to each shop.